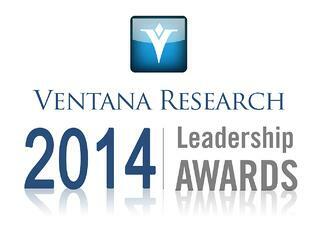 SAN RAMON, CALIFORNIA, September 18th, 2014 – Ventana Research today announced the 27 winners of the 2014 Technology Leadership Awards. These Awards, presented annually, identify business and IT leaders who are using technologies and applying best practices to provide the best possible outcomes in productivity, performance and support of an organization’s goals and objectives. The awards thus recognize pioneering leaders and organizations that embrace technology to drive change and increased value for organizations across the world. The Technology Leadership Awards and the ceremony at which they are presented have become an industry tradition. This year’s award recipients will receive their awards during the Technology Leadership Awards Ceremony at the 2014 Ventana Research Summit on Oct. 22, 2014 at the Hyatt Regency San Francisco Airport in Burlingame, California. shments using technology to deliver the best value in achieving specific goals and objectives," said Mark Smith, CEO and chief research officer of Ventana Research. "Congratulations to all the Technology Leadership Award winners – individuals and companies that have gone the extra mile to advance the use of technology through best practices and leadership. We look forward to seeing you and those interested in learning more about your leadership and best practices at the 2014 Ventana Research Summit." The Technology Leadership Awards, the largest business and technology leadership awards program in the industry, cover 27 categories spanning from big data to mobile technology to CIO and CFO awards. (Categories are listed below.) Submissions were evaluated by Ventana Research based on an established set of awards program criteria; these can be seen at www.ventanaresearch.com/awards. Those interested in hearing in detail how the best practices in technology across business and IT are changing the industry can attend the Ventana Research Summit by registering at www.ventanaresearch-summit2014.com to get a first-hand view of the award winners and insights into these award-winning individuals and organizations along with the technology vendors they depended on to help their success. Business and Social Collaboration: Abdul R. Qadir and Aon Hewitt using 8x8, Inc. Mobile Technology: Linda Oba-Sayre, :Cisco and The Partner Education Connection using Saba Software, Inc.
Office of Finance: Pat Withrow and The Dow Chemical Company using BlackLine Systems, Inc.
Ventana Research annually invites all vendors to nominate customers using their technology products to be considered for the awards; organization executives are invited to submit nominations as well. Award recipients are selected based upon organizations’ or individuals’ leadership accomplishments in innovating or enhancing the productivity and outcomes of business or IT processes. Ventana Research highlights and acknowledges the importance of these accomplishments through the Technology Leadership Awards. To learn more about the Ventana Research’s awards programs and to see what previous award recipients have said about them please visit: www.ventanaresearch.com/awards.